The weather has been pinballing all over the place, 70F in February then down to freezing a few days later. Hard to get a handle on things. 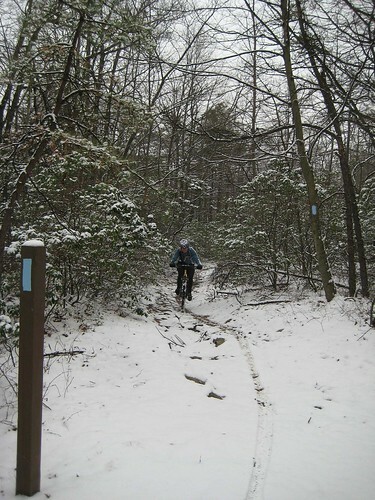 Woke to rain/sleet in town on Saturday, but it snowed an inch on the ridge to make for a fun ride before it melted mid day and left us with warm temps again. Weird. Came home empty handed from the bike swap but that's OK, that means I didn't buy a bunch of crap I did not need. Looks like tonight's ride is a rain out. Ice coated everything thick this morning, changed to rain, expected to change back to snow later on. I may actually have to mount up the studded tires this season if this stuff keeps up. Of course, tomorrow is forecasted for the mid 40s and Friday the mid 50s so who knows what the rest of this winter will bring. Will the big ride for this weekend happen or not? Who knows, just have to sit tight and make a decision at the last minute.